Slidekamera HDN DC drive, dedicated for Slidekamera devices, is equipment specially designed for smooth shots in motion ranging from 2mm/s to 55mm/s as well as Timelapse photos. Quiet operation reduces the noises to the minimum on the recorded material. Additionaly, the device is very light, its weight does not exceeds 1kg. Speed stability of our drive ensures perfect smoothnes of motion both horizontally and at a certain angle (max ~30°). HDN drive propulsion module is designed in a way to allow simple connection / disconnection of the drive at any time, ie, the cameraman can perform alternately hand held camera movement and use the drive. controller is equipped with a 2,5mm Trigger jack to connect the shutter release cable. Drive can be supplied from either AC adapter or three R6/AA batteries. Drive controller is equipped with 1/4" mounting hole that allows to mount it on devices with the use of VARIO ARM - Classic 8" or 11". VIDEO mode: VIDEO mode is designed for smooth shots from the camera or a photo camera mounted on a cart of Slidekamera device. It is possible to control the direction and speed of the shift using SPEED knob. LOOP mode: LOOP mode similarly to VIDEO mode, is designed for smooth shots from the camera or a photo camera mounted on a cart of Slidekamera device. In this mode, when the drive encounters too much resistance, it automatically starts to move in the opposite direction. TIMELAPSE mode: Timelapse shots synchronized with the movement of the cart (Motion Timelapse). In this mode, the operator sets the length of the jump and time at which the drive stops thus enabling to take a photo without a motion blur. Thanks to the cable release that connects the controller with the photo camera, the drive controller releases the shutter in time when the cart is motionless. 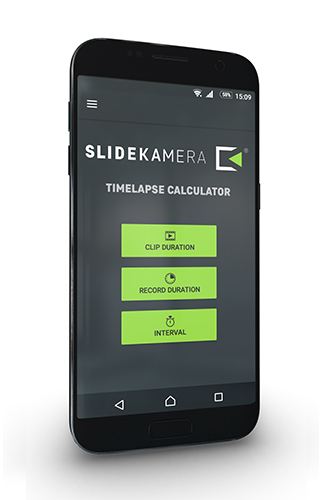 Application that allows you to calculate all parameters for Timelapse photography. It is aimed not only at Slidekamera customers, but also at all photo and video enthusiasts, professional and amateur alike. If you already have HDN drive you can use a mode that adjusts calculated values to your equipment. This app is optimized for Android tablet or smartphone.